The US military was interested in Greenland during the Cold War due to its strategic location in the Arctic. 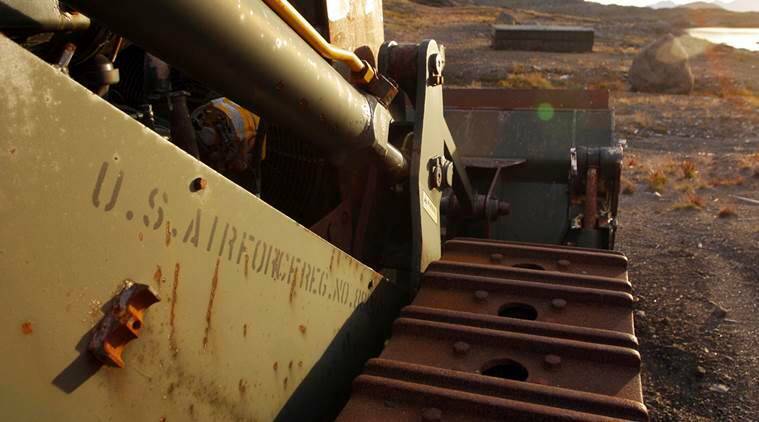 Greenland is calling on Denmark to clean up an abandoned under-ice missile project and other U.S. military installations left to rust in the pristine landscape after the Cold War. The 1951 deal under which NATO member Denmark allowed the US to build 33 bases and radar stations in the former Danish province doesn’t specify who’s responsible for any cleanup. Tired of waiting, Greenland’s local leaders are now urging Denmark to remove the junk that the Americans left behind, including Camp Century, a never-completed launch site for nuclear missiles under the surface of the massive ice cap. “Unless Denmark has entered other agreements with the United States about Camp Century, the responsibility for investigation and cleanup lies with Denmark alone,” said Vittus Qujaukitsoq, Greenland’s minister in charge of foreign affairs. Camp Century was built in 1959-60 in northwestern Greenland, officially to test sub-ice construction techniques. The real plan was top secret: creating a hidden launch site for ballistic missiles that could reach the Soviet Union. The project was abandoned in 1966 because the ice cap began to crush the camp. The US removed a portable nuclear reactor that had supplied heat and electricity, but left an estimated 200,000 liters of diesel oil and sewage, according to an international study published in August. PCBs stands for polychlorinated biphenyls, a man-made chemical once widely used in paints, plastics and other products, but were banned after they were demonstrated to cause cancer and other ailments. At a meeting on Nov. 17 in Nuuk, the Greenland capital, to discuss the issue, Jensen said Denmark’s Environment Ministry was investigating the environmental risks. The US military was interested in Greenland during the Cold War due to its strategic location in the Arctic. Under the 1951 agreement, the US also built four radar stations as part of an early warning system to detect incoming Soviet bombers. The US Air Force still uses the Thule Air Base, about 1,200 kilometers (745 miles) below the North Pole. Military airfields in Narsarsuaq, Kulusuk and Kangerlussuaq have become civilian airports. Several other military installations have been abandoned, some in remote areas, in the hope they would be entombed forever in the thick ice cap that covers most of the vast island. Local authorities have started clearing some of the sites, but don’t have sufficient resources, said Rasmus Eisted of Danish engineering company Ramboll, which has been involved in some cleanup projects. Eisted singled out a junkyard in Kangerlussuaq containing miscellaneous military equipment from the time it was a US Air Force Base known as Sondrestrom. The continuing cleanup task was larger than first anticipated, he said. Aleqa Hammond, a former Greenland premier who now represents the mostly Inuit population of the Arctic island in the Danish Parliament, said Greenland could bring Denmark before a UN panel on indigenous issues unless it deals with the junk. “Denmark is responsible for cleaning up after the Americans,” Hammond told AP. “I see a potential political crisis between Greenland and Denmark.